All that’s needed to make this craft is large paper (we used a large roll of paper that we picked up from the newspaper a few years back), paint and some small apples. The neighbour next door has generously offered that we can pick the apples from their trees which we have been doing and have already made gluten free apple crisp and a tiny bit of applesauce from. 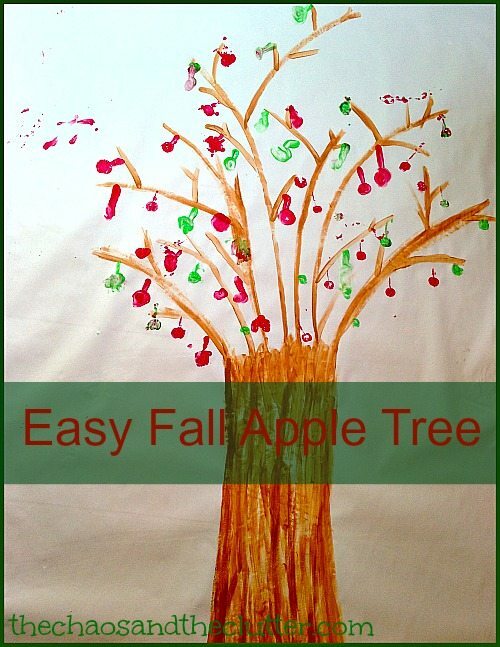 When I thought of this craft idea, I sent the kids next door to get a few apples and they came back awhile later with a bag of store-bought apples from our neighbour two doors down because the ones on the trees next door were too small! This gave me a bit of a chuckle as we had our own store-bought apples but I wasn’t wanting to waste them on this craft! I sent them to return the large apples to the farther neighbour and fetch me some tiny apples from our own small apple trees out front. When they returned, I cut the tiny apples in half, keeping their stems attached. 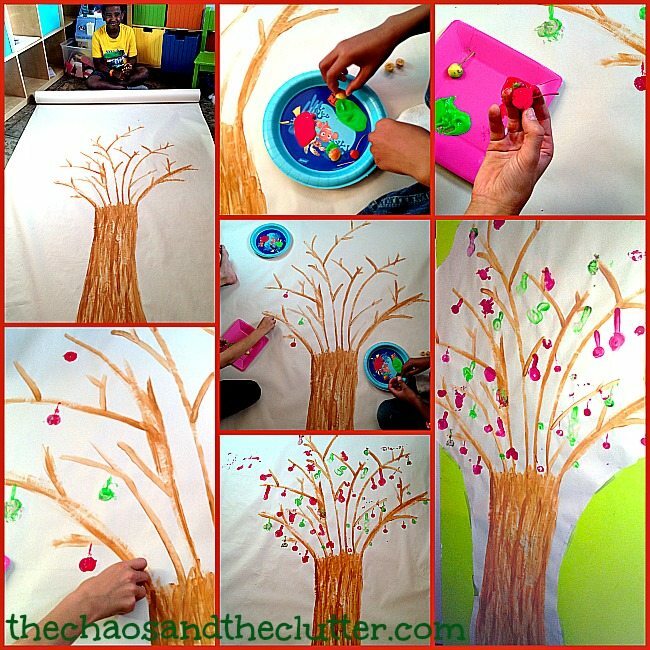 I painted the outline of a tree trunk and branches onto the large paper and then let the kids get in there with the apples to do some apple print painting. We always find it easiest when working with tempera paint to put it in paper plates first. The kids used the apples as stamps and with their stems, they were able to make it look as though they were growing on the tree. When the completed project was dry, the kids cut it out and taped it onto the wall. I think it makes great fall wall decor for our homeschool room! If you are looking for other simple fall craft ideas, you may want to check out the easy fall crafts we made using household items or follow my Fall Pinterest Board. I had to laugh at myself… cause I was catching up on your blog, wanted to comment, and then couldn’t find the comment button! Wasn’t until I came back that I noticed it at the title. Oh my… yes, just getting back in the blogging saddle and new to these new formats… like I’m a newby all over! LOL. Anyway, I love this craft! I’ve been watching a couple toddler a few days a week and I am always looking for new ways to entertain. I think they will love this! (Only I will paint the trees and they can ‘stamp’!) Thanks for sharing.